Suitable for economic students and those who have interest in how economies work, this title provides more that 100 of the big ideas in economic theory and practice covering from ancient theories right up to modern developments. 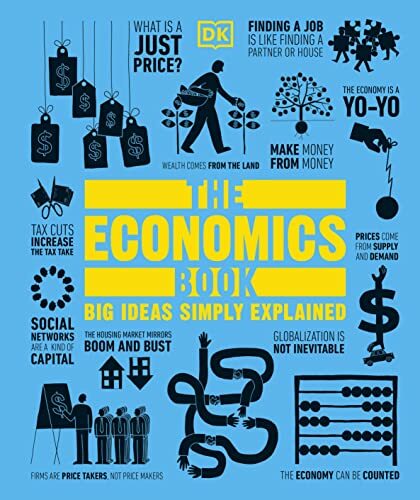 All the big ideas, simply explained - an innovative and accessible guide to economics Bring economics to life with The Economics Book, an essential guide to more that 100 of the big ideas in economic theory and practice covering everything from ancient theories right up to cutting-edge modern developments. From Aristotle to John Maynard Keynes and beyond, all the greatest economists and their theories are featured and the innovative graphics, step-by-step summaries and mind maps help clarify hard-to-grasp concepts. The Economics Book is perfect for economic students and anyone who has an interest in how economies work.